Satellite images show that since the early 1980s Arctic North America has been “greening.” To date, most research on the causes and effects of greening have dealt with how vegetation changes affect energy budgets and how nutrients like carbon and nitrogen cycle between plants and soil. How vegetation changes influence the distribution of arctic animals and birds is less well-understood, but Ecosystem Ecologist Natalie Boelman (Lamont-Doherty Earth Observatory, Columbia University) along with colleagues Laura Gough (University of Texas at Arlington), and John Wingfield (University of California, Davis) want to change this, with NSF support, by learning more about arctic phenology—how climate warming-induced changes to tundra vegetation and earlier snowmelt dates affect the reproductive success of migratory songbirds. Field technician Heather Graves and graduate student Jesse Krause pose with Dark-eyed juncos. Boelman and colleagues focus on two bird species: the Lapland longspur and the White-crowned sparrow. Both species are songbirds, included in a group of more than 4000 species having specific and often elaborate bird songs which communicate territorial and mating information. Both species migrate to the Arctic each summer to breed—the longspur from the central North America and the sparrow from southern North America, and even Mexico. In 2010, the team based out of Toolik Field Station and worked in nearby Atigun Valley, near Imnavait Creek and just south of Happy Valley. 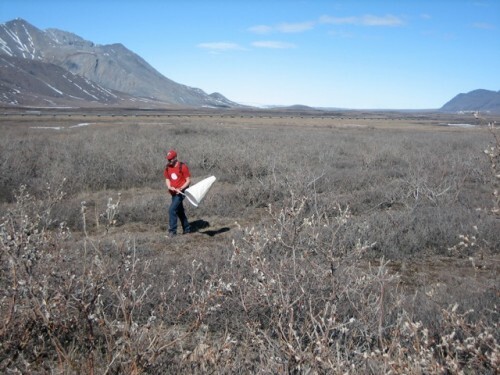 Boelman’s team set up four experimental field sites, each with a “shrub plot” and an “open plot.” They also installed weather stations and acoustic monitoring stations at each site and sampled flora and fauna along 100 m transects weekly, between mid-May and the end of July. Acoustic monitoring stations included a microphone set to record sound in the frequency range of 140-18,000 Hz. The team set stations to turn on four times a day – at 2, 6, and 9a.m. and 6p.m.—and record whatever was making noise (hopefully, the Lapland longspur and/or the White-crowned sparrow as well as other songbirds). Recordings helped the scientists track the presence (or absence) and numbers of the migratory songbirds as well as their activity levels from when the birds arrive on the tundra in mid-May until their southward migration in the fall. A tripod set up at the Rocher Mountonee site in Atigun Valley. The tripod is protected by a bear fence. Stations also included a camera for monitoring snow cover during the melt period between spring and summer, as well as weather sensors which measure and record temperature, wind speed and direction and precipitation. All equipment was assembled on large tripods at Toolik Field Station and driven to the field sites, which were located along a short latitudinal gradient along the Dalton Highway. From the drop off points, the team carried or dragged the tripods using a sled over the tundra to the field sites. Tripod bases were left to spend the winter on the tundra, but rented monitoring equipment will be re-installed each field season. Boelman and her colleagues will be working with two teachers from Fairbanks, Alaska (who spent two weeks in June working with scientists at Toolik Field Station) and educational staff from the Alaska Bird Observatory to develop educational materials that meet science curricula standards for high school students. They will also set up a long-term monitoring site in Fairbanks where students will learn to follow the scientific protocols used in the Toolik-based field study. 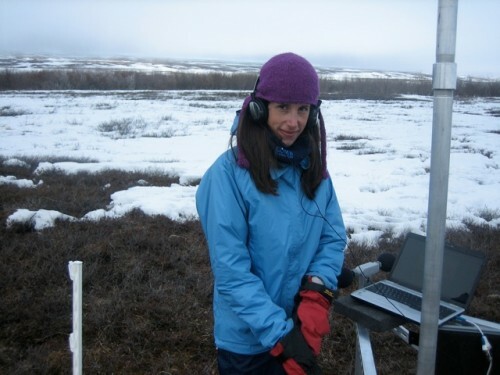 The five-year study will mean a lot of time away from home, but Boelman clearly enjoys her field work and colleagues. For more information and photos from the 2010 field season, visit the project website.